Most American children live healthy lives. Car seats, safe cribs, and strollers help protect your child in and near the home. Yet, parents and caregivers still have to be careful and cautious. Explain certain dangers to children. This can help them understand why and how they can stay safe. All teens and adults should learn CPR. Teach your child about poisons that may be in the home or in the yard. Your child should know about not eating berries or leaves from unknown plants. Almost any substance, when eaten in large enough amounts, can be harmful or poisonous. Only buy toys that say non-toxic on the label. Keep cleaning fluids, bug poisons, and other chemicals out of a child's reach. DO NOT store toxic substances in unmarked or inappropriate containers (such as food containers). Keep these things locked up if possible. DO NOT use pesticides on plants if possible. Buy medicines with child-resistant caps. Store all medicines out of the reach of children. Keep cosmetics and nail polish out of reach. Put safety latches on cabinets that a child should not open. Always keep one hand on an infant who is lying on a changing table. Place gates at the top and bottom of each stairway. Gates that screw into the wall are best. Follow the manufacturer's safety instructions. Teach your child how to climb up the stairs. When they are ready to climb down, show them how to go down steps backwards on their hands and knees. Show toddlers how to walk down steps one step at a time, holding on to someone's hand, a handrail, or the wall. DO NOT put a crib or bed near a window that a child can open. Place guards on windows to prevent them from opening wide enough for a child to fit through. Make sure fire escapes are not accessible or have adequate fencing. Children, 6 years old and younger, should not sleep in the top bunk. They lack the coordination to prevent themselves from falling. Put bunk beds in a corner with walls on two sides. Make sure the guardrail and ladder for the top bunk are firmly attached. DO NOT allow jumping or roughhousing on top of or underneath the bed. Have a night light in the room. Keep guns locked up and unloaded. Guns and ammunition should be stored separately. Never claim you have a gun with you just as a prank. Never say, even as a joke, that you are going to shoot someone. Help children understand the difference between real guns and weapons they see on TV, movies, or video games. A gunshot can permanently injure or kill someone. Stop and do not touch. This means not to play with the gun. Leave the area. If you stay and someone else touches the gun, you may be in danger. Keep your child safe by taking action to prevent choking. Keep toys with small parts out of the reach of infants and toddlers. This includes stuffed animals with buttons. DO NOT allow young children to play with coins or put them in their mouths. Be careful about toys that can easily break into smaller pieces. DO NOT give popcorn, grapes, or nuts to infants. Watch children when they eat. DO NOT let children crawl or walk around when they eat. Learn how to perform abdominal thrusts to dislodge an object a child is choking on. Make sure cribs, beds, and furniture where children sleep, play, or crawl are away from any windows with cords. Tie up the cords so they are out of reach. But never tie two cords together so they create a loop. Keep plastic bags and other things that can cause suffocation away from children and out of their reach. DO NOT put extra blankets and stuffed animals in a crib with a baby. Put babies on their backs to sleep. Take precautions when cooking to prevent burns. Make sure the handles on pots and pans are turned away from the edge of the stove. DO NOT cook while carrying your child. This includes cooking on the stovetop, the oven, or a microwave. Put child-proof covers on stove knobs. Or remove stove knobs when you are not cooking. When cooking with older children, do not allow them to handle hot pots and pans or dishware. When heating a baby bottle, always test the temperature of the liquid to prevent burning your baby's mouth. Keep hot cups of liquid out of the reach of young children. After ironing, allow the iron to cool in a safe spot away from young children. Set the water heater temperature to 120°F (48.8°C). Always test the water temperature before your child bathes. Keep matches and lighters locked up. When children are old enough, teach them how to use matches and lighters safely. Check playground equipment for signs of deterioration, weakness, and damage. Keep an eye on your child around the playground. Teach children what to do if strangers approach them. Teach them at an early age that no one should touch private areas of their bodies. Make sure children know their address and telephone numbers as early as possible. And teach them to call 911 when there is trouble. Make sure your child knows how to stay safe around cars and traffic. Teach your child to stop, look both ways, and listen for oncoming traffic. Teach your child to be aware of cars in driveways and parking lots. Drivers backing up cannot see small children. Most vehicles do not have rear-mounted cameras. Never leave your child unattended near streets or traffic. Never use a power mower when a child is in the yard. Sticks, rocks, and other objects can be thrown at high speeds by the mower and injure the child. Keep children away from hot cooking grills. Keep matches, lighters, and charcoal fuel locked up. DO NOT dump charcoal ashes out until you are sure they are cool. Put child-proof covers on grill knobs. Or remove the knobs when the grill is not in use. Follow the manufacturer's instructions about safely using and storing a propane cylinder tank for outdoor grills. American Academy of Pediatrics. Healthychildren.org website. 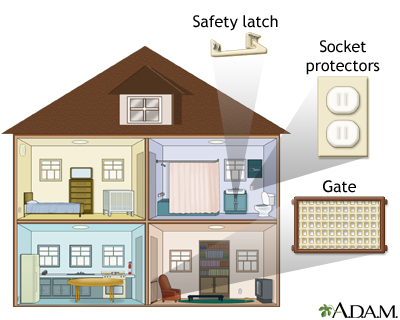 Safety and prevention: Home safety: here's how. www.healthychildren.org/English/safety-prevention/at-home/Pages/Home-Safety-Heres-How.aspx. Updated November 21, 2015. Accessed October 7, 2017. American Academy of Pediatrics. Healthychildren.org website. Safety and prevention: home safety: protect your child: prevent poisoning. www.healthychildren.org/English/safety-prevention/all-around/pages/Keep-Your-Home-Safe-From-Poisons.aspx. Updated November 21, 2015. Accessed October 7, 2017. Centers for Disease Control and Prevention website. Protect the ones you love: child injuries are preventable. www.cdc.gov/safechild/indexl. Updated March 28, 2017. Accessed October 6, 2017. Dowd MD, Sege RD; Council on Injury, Violence, and Poison Prevention Executive Committee; American Academy of Pediatrics. Firearm-related injuries affecting the pediatric population. Pediatrics. 2012;130(5):e1416-e1423. PMID: 23080412 www.ncbi.nlm.nih.gov/pubmed/23080412. National Highway Traffic Safety Administration website. Everyone is a pedestrian. www.nhtsa.gov.edgesuite-staging.net/Pedestrians. Accessed October 6, 2017. There are several inexpensive steps a person can take to prevent accidental injury in the home. Safety latches can keep household cleaning materials and chemicals locked out the reach of children. Gates can block off dangerous areas of the home and prevent falls when used at the top of the stairs, and socket protectors block a child's access to dangerous electricity. Many accidents can be avoided by closely supervising children and by simply practicing these and other preventative measures in the home. Keep cleaning fluids, bug poisons, and other chemicals well out of a child's reach. Avoid storing toxic substances in unmarked or inappropriate containers (such as food containers). If you suspect poisoning or have questions, call 1-800-222-1222.